Mangala Gouri Vrat 3rd September 2013. Mangala Gowri Puja is dedicated to Goddess Gouri also known as Goddess Parvathi. They will offer puja to Lord Ganesh before performing Gowri puja. Newly married women observe Mangala Gowri Puja in the first five years of their marriage in Srvana month on Tuesdays. Tuesdays in the shravana month are also known as Shravana Maasa Mangalvar. Monday dedicated to Lord Shiva and Tuesdays for Goddess Parvathi. Special pujas dedicated to Goddess Gowri is performed on the day and women dress up like a traditional married woman with all bangles and flowers symbolically indicating to Goddess Gowri that they want to be like this on all days. On Tuesday morning, idol of Mangala Gouri made with turmeric paste and then placed on a wooden platform wrapped in a red cloth decorated with flowers. A lamp using wheat flour is made and then 16 cotton wicks are placed into it. Ghee is used to lighting the lamp. Number 16 has special significance in this Pooja. 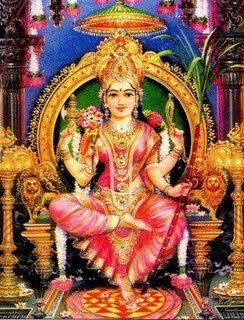 The puja is done with the intention that Goddess Gowri will bless the house with material prosperity, health and long life. 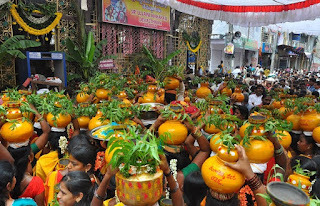 After completion of Mangala Gouri Vrat women give Thamboolam includes betel leaves (Thamalapak), Kumkum, Turmeric,Soaaked bengal gram, Bangles, Blouse piece. They offer flowers and kumkum then apply turmeric paste while presenting tamboolam. Mangala Gouri is also one of the nine incarnations of Goddess Durga. The method of Pooja and mantras used vary from region to region.